Beresford Hall, just off Clements Ferry Road North on the Cainhoy Peninsula, is quiet. Country quiet. Remarkably, Beresford Hall is also only minutes away from I-526, downtown Charleston and Mount Pleasant, and one exit from the amenities of Daniel Island. Still, it’s easy to forget the hustle of city life once inside the gates of the community. 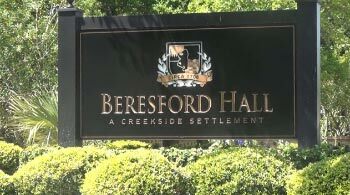 Words such as community and neighborhood are often heard when talking to anyone involved with Beresford Hall. It’s obvious that everything was planned with community in mind—not community in the simple sense that it contains houses, but community as a philosophical concept. Having built three houses there, Ernie Diloreti, owner of Diloreti Construction, summarizes, “It is just a well-planned, family-centered community.” Good luck finding someone involved who refers to Beresford Hall as a development. Beresford Hall offers plenty of elbowroom. Lots are at least three quarters of an acre, while some go as high as three. Most developers would have squeezed more lots out of land this size, but that was not Greenwood’s vision. Lots range from deep-water sites with piers to interior lots overlooking ancient fields (one of which predates the colonial era) lined with ancient moss-draped live oaks. In addition to lot size, Ernie points out that required natural curtains and clearing guidelines for each lot enhance both privacy and the rural attitude of Beresford Hall, plus there are numerous permanent green spaces, such as an eight-acre meadow and five parks dotted throughout the community. Today, the epicenter of Beresford Hall is the community center—“The Ruins”—cunningly designed to reflect a ruined 18th-century brick plantation house. Designed by preeminent architect Jim Thomas, the center features a large pool pavilion with a rustic lodgelike dining room and deep porches with an enormous covered grill and outside fireplace. The adjacent swimming pool overlooks the marsh. Rearward and to the side of the center, the icehouse—a smaller architectural “ruin”—shelters a commercial ice machine and sits beside the community boat launch, convenient for fishing, skiing or a sunset cocktail cruise.